We take this Italian convertible hot hatch out on the open road. 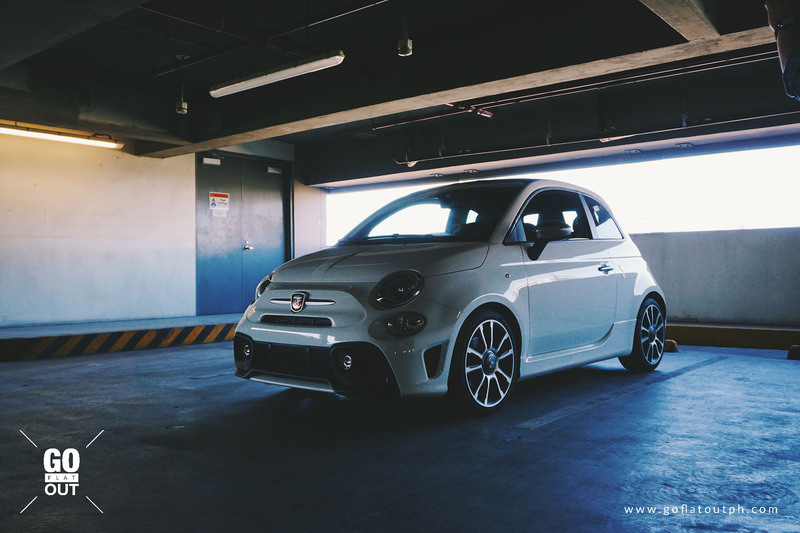 Last December 2017, Go Flat Out had the opportunity to talk to the folks from Abarth Philippines and what they were currently up to, including a short drive of the Abarth 595. As it turns out, the brand is currently selling its Abarth line-up of high performance hot hatches in small numbers and to a very discerning clientele. These people who seek for an Abarth really know what they’re putting their money into, and clearly have the passion for the Abarth brand. 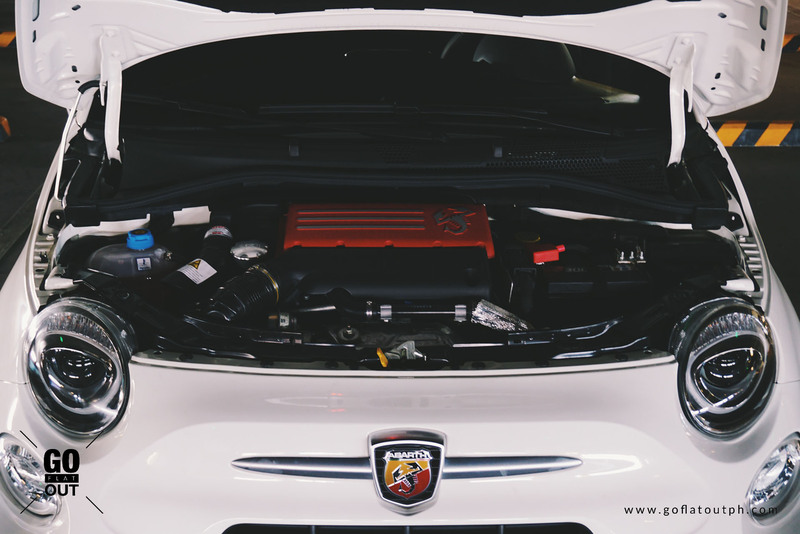 Not a lot of people know Abarth, and chances are, if you encounter someone who knows Abarth, they’re most likely car enthusiasts, too, and that’s a good thing, since Abarth is only known to who truly like cars and treat cars are more than a means of transportation. What we have here is the 2018 Fiat 500 Abarth 595 Turismo. 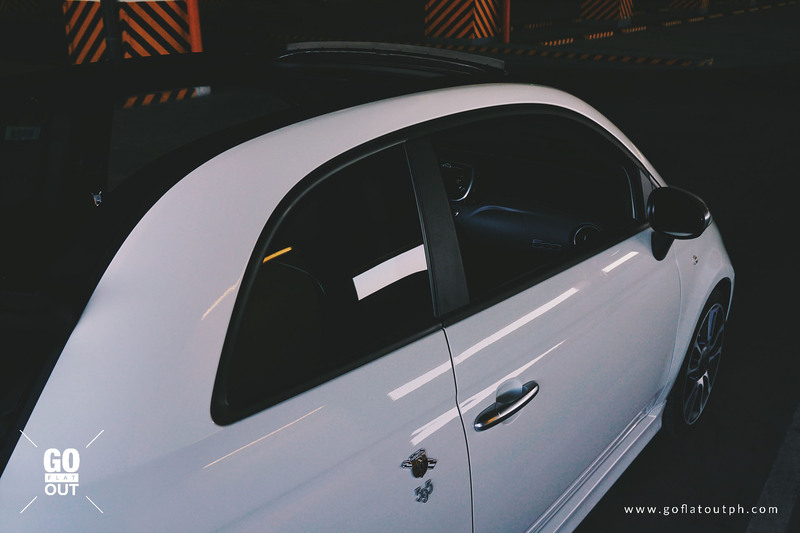 On the outside, it’s got that typical Fiat 500 silhouette that we’ve seen for a decade now, but it’s still a design that looks fresh and timeless. This is retro design done right, folks. Being the Turismo model, it gets snazzy 17-inch alloy wheels wrapped in sticky 205/40 low profile Pirelli PZero tires. A simple look at it already bring a sense of occasion, probably because it is rare to see one in the Philippines, but it’s really mainly because of its timeless design. This little hot hatch has the same potent 1.4 liter liter T-JET turbocharged petrol engine from the base Abarth 595. However, this motor gets a boost of power, now producing 165 hp and 230 Nm of torque. A 0-100 kph time of 7.3 seconds is quoted by Fiat, but the good thing is, this engine pulls hard throughout the rev range. The way this thing accelerates seems faster than what the manufacturer claims. The exhaust also sounds throaty and nice. It isn’t over the top, with an absence of crackles and pops, but it’s sufficient for the pedigree and performance one is looking for in an Italian hot hatch. What makes this Fiat interesting is that, it’s a cabriolet. Its roof is made out of fabric, but the pillars are retained, creating a unique look while on the road. Intuitively, the roof folds up slightly if you want to access the trunk. At speed, it is quite surprising how little wind noise permeates through the roof. It even deals with noise better than the car’s windows, which is surprising considering the fact that the roof is made out of fabric. Unlike the Fiat 500 Abarth 595 we last drove, this one uses a 5-speed semi-automatic transmission. Shifts are quick, but shifting without lifting off the pedal jerks the car, typical for any vehicle with this transmission. When in pure automatic mode, the transmission can feel sluggish, but put it in manual mode, and this little Fiat drives like a dream. It even automatically blips the throttle when you downshift, letting you hear the naughty bark of the engine. 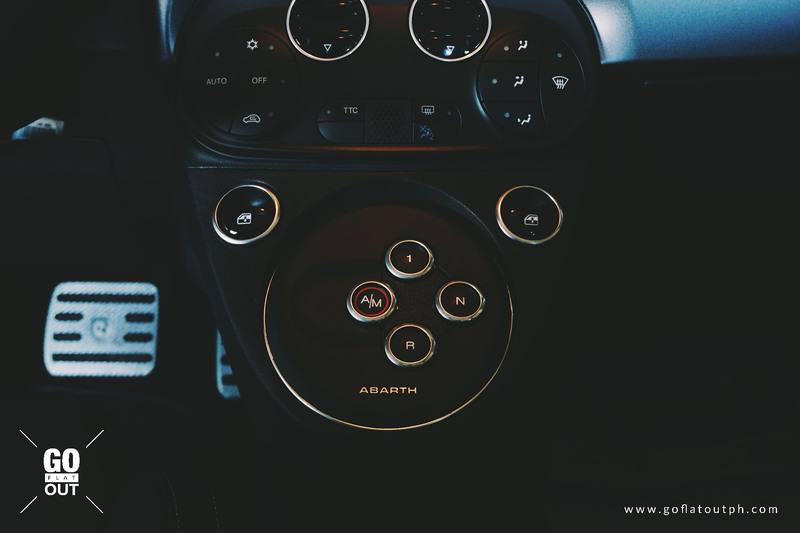 As a whole, we’d really recommend getting any Abarth with a manual gearbox. Keeping the car’s body in check are its KONI rear shock absorbers, plus both front and rear springs feature Frequency Selective Damping. The drilled front and rear discs do an excellent job of scrubbing speed. Go Flat Out was only able to take this little Fiat on a short drive on a public road, in which speed limits are set, and traffic rules are needed to be obeyed, yet we were able to at least give it a try to find out its handling and performance capabilities. 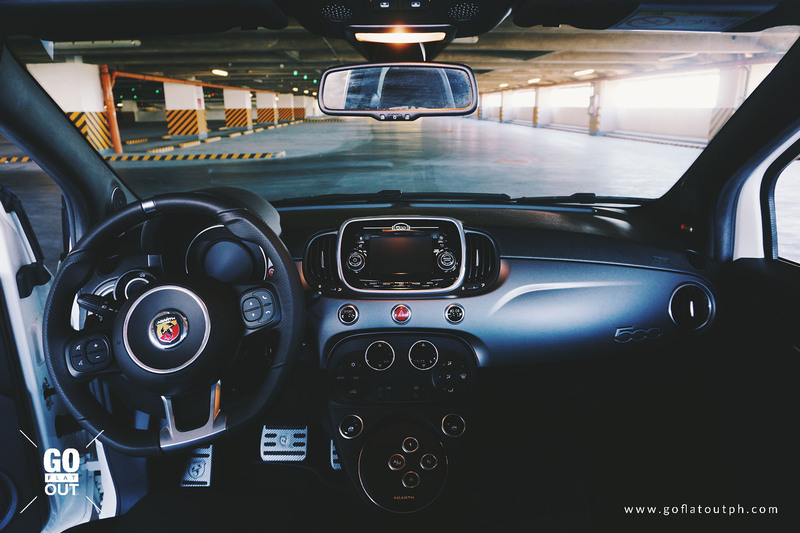 Inside, this little Fiat is packed with features, including, but not limited to, a uConnect infotainment system that features Apple CarPlay and Android Auto, and a bombastic Beats Audio sound system. As Isaac plugs in his smartphone and his Spotify playlist streamed through Bluetooth, the sound system delivered bass-heavy and rich sound. Sound systems like these are indeed best appreciated with CDs. Speaking to Deniz, we asked whether their company plans to bring non-Abarth Fiat models. Unfortunately, he tells us that shipping the standard Fiats would make the car too expensive to compete with the likes of the Honda Jazz, Ford Fiesta, or Volkswagen Polo, cars in which it competes with in the European market. 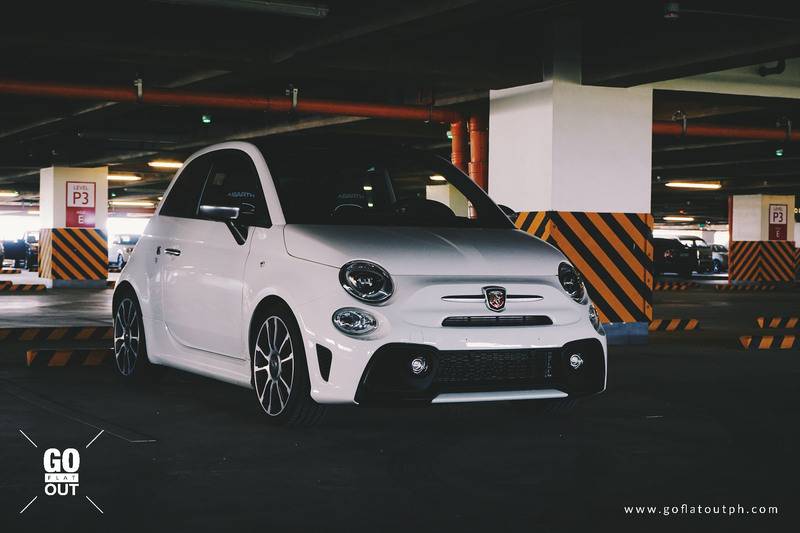 As such, only the Abarth models will be brought to the Philippines. 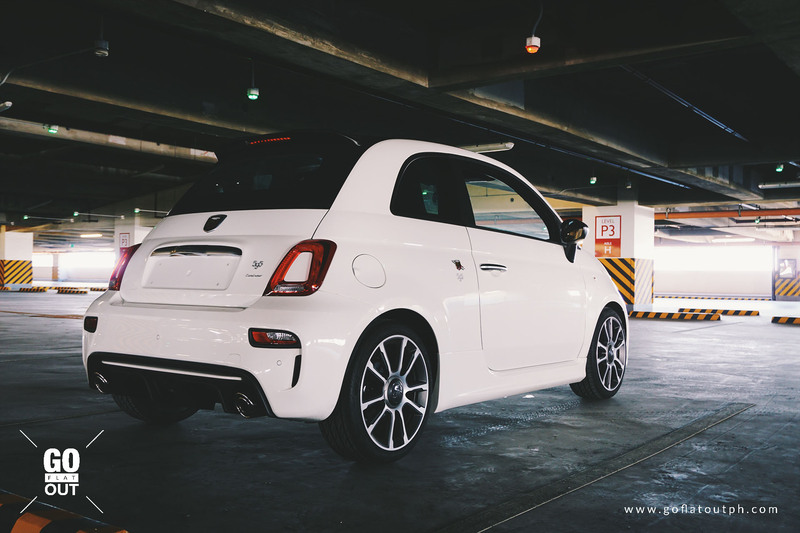 If you seek for a hot hatch that has that special Italian flair that only an Abarth can deliver, why not try cheking out their Facebook page and see what they can do for you today.